Council adopted the Long Term Plan 2018-28 on Tuesday, 26 June 2018. Council is grateful to all those who contributed and gave feedback on the Long Term Plan 2018-28. Information on the Long Term Plan Hearing can be found here. Consultation on the 2018-28 Long Term Plan (LTP) has opened, with the release of our LTP 2018-28 consultation document. Our consultation document 'Our Place Our Future?' should have arrived in your mailbox with The Courier newspaper on March 8. Big Issue 1: Our Water...What Price? A resilient future water supply? How should we achieve this? Submissions have closed. Thanks to those who gave us your feedback. You can read the submissions received here. We want to hear your views. You can submit on the issues highlighted or anything to do with the Long Term Plan. Remember to let us know if you wish to speak to your submission at a Council hearing to consider the plan. Please include your contact details. Hearing of submissions is planned to start on Monday 30 April 2018. 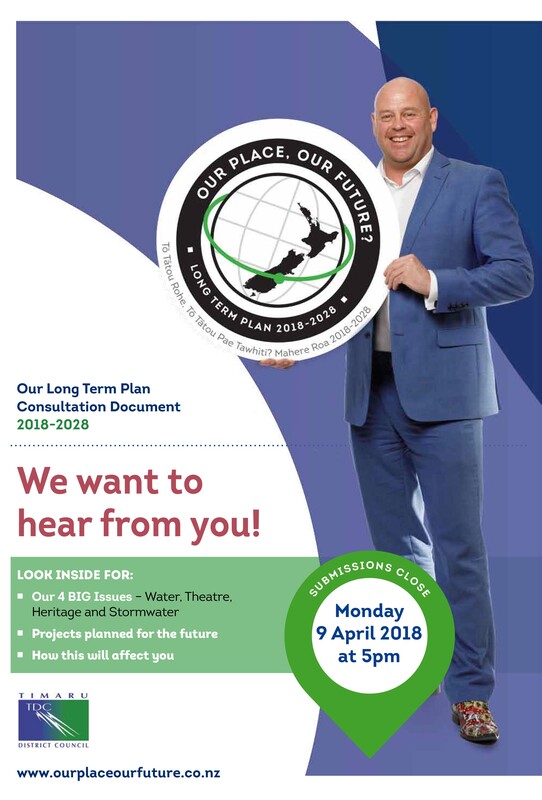 Comments are welcome on the plan from Thursday 8 March to 5pm, Monday 9 April 2018. Groups of Activity Statements - A summary of Council's activities (e.g. Roading, Libraries) including a description of what is provided, why we provide it, the services provided, how we measure performance, planned projects over the next ten years and financial information. Significant Forecasting Assumptions - Key general and financial assumptions on which the Long Term Plan is based. Financial Contributions Policy - A summary of the existing Financial Contributions Policy provisions. All of the documents are also available at the main Council office, service centres and libraries throughout the district during the consultation period.